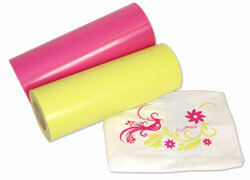 Choosing the right Heat Transfer Material is one of the most important decisions you’ll make in your business. Knowing which materials will work on the fabrics you are applying to is just as important. I’ve created a chart to help you determine what fabrics our various Spectra Heat Transfer Materials are made for. I also added the file below into the Box on the left toolbar. Different screen resolutions may make this appear differently then it should. If there are any questions regarding this chart, the material applications or anything else, please leave a comment below or Email Me. Choosing the Heat Transfer that is right for your application will depend on many factors. What type of equipment do you currently own? How quickly can my customers get their finished goods? How much will the equipment, material or service cost me? To decide which option is your best, you have to ask yourself these questions. Creating your own Names & Numbers with a vinyl cutter is as simple as adding a Heat Applied Material such as the Spectra Eco-Film. Advantage – Owning your own vinyl cutter gives you the most flexibility and is less expensive in the long run. You will have the ability to create on demand with sufficient stock. Roster additions can be made same day. Choosing the correct vinyl cutter will also open you up into different markets, including signs, applique and pre-printed transfers. Disadvantage– Investing in a vinyl cutter can be expensive for some. A start-up business would be well served by making the initial investment but the money isn’t always there. Pricing will range from $1000 – $7995 for the most common cutters purchased. Choosing a model like the Roland GX-24 will get you into all the markets mentioned above for under $2000. When cutting your own, you also are responsible for weeding. Weeding is simply the process of pulling away excess vinyl from the carrier before applying to your garment. The options listed below will usually come ready to apply, no weeding required. Order Pre-Cuts – Ordering pre-cuts is the most inexpensive way to get started with athletic lettering. A Heat Press is still required. Pre-Spaced Player Names – Pre-Spaced Player Names are ordered custom. Input your roster of players, including numbers if applicable, and the names will be sent to you ready to apply. Pre-Spaced Player Names and/or Numbers can be ordered from Stahls ID Direct and ship out within a few days. Advantage– Low start-up cost. Names come ready to apply and no additional work (weeding) is required. Ordering pre-cuts can be beneficial as an outsourcing option. If you are very busy with other projects you can have someone else do some work for you at a reasonable price. Disadvantage– Higher price per name and/or number vs. cutting your own. Turn time and lack of control over your project also has to be considered. Die-Cut Letters – Die-Cut letters and numbers is how the lettering industry got it’s start. Before Vinyl Cutters came about, Dies where used to cut vinyl one letter at a time. Today, Die-Cuts are still a viable option and at a much higher production. Die-Cuts are also available from Stahls. Advantage – Just like Pre-Spaced Player Names, low start-up cost, ready to apply and an outsourcing option. Pricing is a bit lower, much closer to cutting your own. Disadvantage– You’re still lacking control and turn time. Die-Cuts can be stocked but having all the letters, numbers, colors, etc available isn’t always going to happen. Die-Cuts also have to be spaced out. There are tools available to help you accomplish this but it is more time consuming compared to the Pre-Spaced or Cut Your Own options mentioned above. All of these options are viable. If you take the time to answer the questions I posed in the opening and consider the features, advantages and disadvantages, you should be able to determine the transfer that is right for you. If you are a start-up or expanding business without the funds to invest in a Vinyl Cutter, Pre-Cuts will still allow you to create the transfers that your customers require. It is an excellent way to test and build your market. When the time comes, adding the cutter will give you better flexibility, cost savings and expand your offering. I will always recommend cutting your own but each situation is different. If it is feasible, start out right and offer everything that you can to your customers. Keep in mind, if you can’t offer it, odds are someone else can. How much Heat Press Vinyl do you need to fill the job that you just got in? To help you figure it out, I’ve created a tool that will give you an estimate of how much material you need for your job, the recommended order amount, how much that roll will cost you and the cost per piece. You can create an order right from the spreadsheet to send in if you so choose. This isn’t a square inch price but actually the cost of each design including waste. If there are any questions at all on how to use the material calculator, please leave the comment below or email me and let me know. Heat Applied Vinyl? Or Film? A common misconception amongst Garment Decorators is the decorating method commonly known as “CAD-Cut” is using a Vinyl based material. While that may have been true a few years ago, Heat Applied Vinyls, as they’re still known, have come a long way. There are still a few true Vinyls out there. For the most part, however, the transfer material that you purchase from your supplier (hopefully me) is probably a Polyurethane based Film material. Why does this matter to you? The materials that are still considered to be vinyls are PVC based. PVC based films are typically a bit cheaper than their PU based counterparts. The key word there is Cheaper. A PVC based film will be fine for most one-color applications onto cottons, polyesters or cotton/poly blends. You will have a bit of a stiffer hand initially and also after washing. PVC’s tend to stiffen up over time. True Vinyl materials should not be recommended for multi-color applications where the colors are layered one on top of the other. Over time, PVC based materials will separate from each other. I don’t think anyone wants to see an angry customer come into their shop with a couple numbers in their hands instead of on the garment where they belong. Polyurethane based Films are a much more durable application. They are typically quite a bit thinner and have a much softer hand. 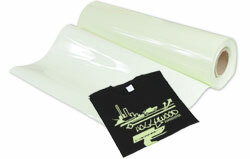 When used as a one-color job, today’s films rival the look and feel of a Screen Print. If you’re a Screen Printer, you may be able to see the difference, but odds are your customer won’t be able to. Multi-color applications are bonded permanently, just as a single color would be. 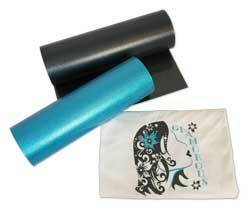 PU Films can also act as a base color for a PVC if you choose. When choosing your “Heat Applied Vinyl” supplier, be sure to ask if the material that you’re going to receive is PVC or Polyurethane based. Not knowing what you’re working with can lead to trouble down the road. The Spectra Eco-Film that I represent with Imprintables Warehouse is a Polyurethane based material. Free samples and color swatches can be requested simply by emailing me at adam@imprintables.com with you’re contact info. PVC based materials are also available for comparison. If you’d like to see the differences between the materials, just email me and let me know. The Heat Applied Material Market is ever-changing. Proof of that is wide range of new materials that is available from the company that I work for, Imprintables Warehouse. If you haven’t seen it yet, we’re launching a new marketing campaign titled “Spectra Goes Hollywood”. The first ad can be seen in the November issue of Printwear Magazine and has already generated an astounding response. Imprintables Warehouse is the industry leader in bringing more Heat Applied Materials to the market that cater as much to the Fashion Industry as any other. Today’s economy doesn’t allow you to have tunnel vision or become complacent. You have to be proactive in finding new business. Do you know the easiest way to do that? Sell more to your existing customers. Offer them more products, more options. A large portion of the Heat Applied Material Users are extremely focused. I’m not one to say this is a bad thing, necessarily, but why not branch out into other areas? Say you’re a Sports Shop doing a lot of Names & Numbers. Does that Football or Basketball Team have a Cheer leading Squad, Dance Team or Spirit Squad? Why not offer them custom decoration as well? Odds are they’ll want something a little more flashy than the standard Red, White and Blue that’s on the players uniforms. The funny thing about consumers is that they usually want to see it before they buy it. A great way to generate interest in any new product is to show your consumers just what it is that they’re getting. You’ll see later in the post a few pictures showing you the materials. My bet is that won’t be good enough for you or your customer so I’m willing to send out samples of the materials for you to try. Just email me at adam@imprintables.com with your info and the material that you’re interested in and I’ll be happy to send out your free sample. Spectra Alloy is similar to the Foil that is currently offered by Imprintables Warehouse. One of the differences is the Alloy is a bit thinner. Also, the Alloy isn’t offered as a Sparkle finish the way some of the Foils are. Alloy is a more flexible option with a new color offering. Anyone currently using the Foils should also give the Alloy a try. Have you had inquiries about an extreme glitter custom decoration? If so, Spectra Glitz is the product you’ve been waiting for. I know that sounds like a cheesy intro, but the shoe sure does fit! The Glitz is another option that is similar, yet still different from Spectra Megatallic. Glitz is full-on Glitter. You know how you used to put some glue on paper in Kindergarten and then throw some glitter on top? Imagine that on a shirt, only a lot less messy. Up until the Fashion Flock was introduced, Flock has been a little boring and one dimensional. Now, there is a selection of colors to choose from giving you many different options. Flock is really an underrated material. For the Fashion Market, it’s great! A raised appearance, soft hand, 3D type look can be very popular. All you have to do is show it! How about a Glow in the Dark Material? That’s what you get with the new Spectra Glowz. Glow in the Dark materials can be used year round. What are the possible markets? Bars or Night Clubs, Trick or Treating (there’s always next year), accent to another type of custom decoration, etc. What are your ideas? Leave your comments below.